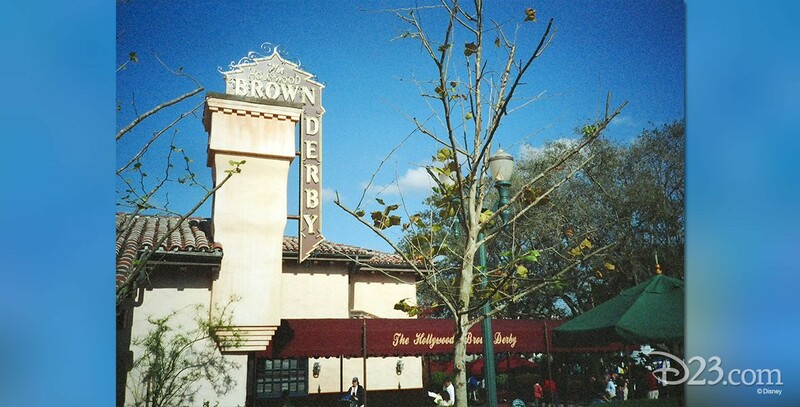 Hollywood Brown Derby, The The most elegant restaurant at Disney’s Hollywood Studios; opened on May 1, 1989. Replica of one of the most famous early restaurants of Hollywood, where the Cobb Salad and a delicious grapefruit cake were invented. Both are served here, along with many other tasty meals, in a teak and mahogany setting. The waiters and waitresses are all dressed in tuxedos, a sharp contrast to the attire of the normal theme park guest. On the wall are copies of the famous caricatures of Hollywood personalities that graced the wall of the original Brown Derby.